From the “Picture Book of Courtesans”(Keisei ehon). 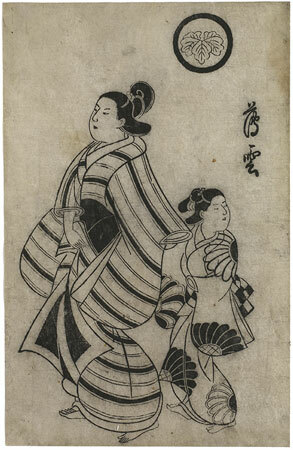 In this generous composition, Kiyonobu has the courtesan Usugumo striding energetically towards the left, with her little kamuro holding on to one of her loose sleeves. The dynamism is enhanced by the parallel stripes of her kimono. Her crest, an ivy leaf (tsuta), appears in a circular mon. The courtesan Usugumo („veil of clouds“) marches with her energetic strides to the left. A small kamuro clutches at her loose sleeves, looking backwards. The impression of this movement is increased by the parallel stripes of the courtesan’s kimono. Her crest, an ivy leaf (tsuta), appears in a circular mon. The courtesan’s name was most probably inspired by chapter 19 of the Genji-monogatari.